This article first appeared in Options, The Edge Malaysia Weekly, on July 17, 2017 - July 23, 2017. It has been a little more than a year since Kim Lim, 27, Lee Swee Lin, 24, and Suzanne Ling, 24, delivered their first meals cooked by a Myanmar refugee family, whose adorable youngest boy, Picha, had captured their hearts. The Picha Project was set up initially in response to what its three co-founders saw as a need for volunteers from university to teach refugee children. Financial difficulties often forced the older children to give up their education to either get a job or to take care of their siblings while their parents worked. Though deemed a “school project” by detractors at the time, the social enterprise today works with nine refugee families from Myanmar, Syria, Afghanistan, Palestine and Iraq, running a food delivery, buffet-style catering and open-house event business. As at May, their total sales were slightly more than half-a-million ringgit, with 50% of the profits going to the families, while monthly sales average RM40,000. Not bad for a team consisting of only the three co-founders, who do everything from orders to packing and delivery with the help of only irregular volunteers. “If you had asked us a year ago, these numbers would have seemed big to us. But our mentors have shown us that we have been aiming too low. So we learnt to ‘brainwash’ ourselves to see things realistically and that we could do a lot more. We have been trying to up our game, so to speak, to grow and strengthen the business and structure,” says Ling. While hiring is on the cards, and perhaps the purchase of a delivery van, the trio are certainly not slacking off on innovation — a big factor in their success. Take their latest venture of hosting open-house events at the homes of the refugee families. “It started last Raya when we were invited to celebrate with the families. They always cook a feast, so we thought, ‘Why not invite people to come along and charge them to cover the cost of their cooking’? Surprisingly, the response was great. It sold out during Christmas when we tried it again, and again on Valentine’s Day. Last month, we did about 12 sessions during Ramadan. What’s most important is how much impact we see through this. “We’ve had people helping pay off the debts of the families when they hear of it during a visit or their medical bills, sponsoring the children’s education, buying them a fridge … there is also a lot of open conversation, although we are there to moderate if things get too sensitive. It’s very experiential and organic. From September, it will be a weekly thing,” says Ling, adding that cooking classes and on-shelf products are also in the pipeline. 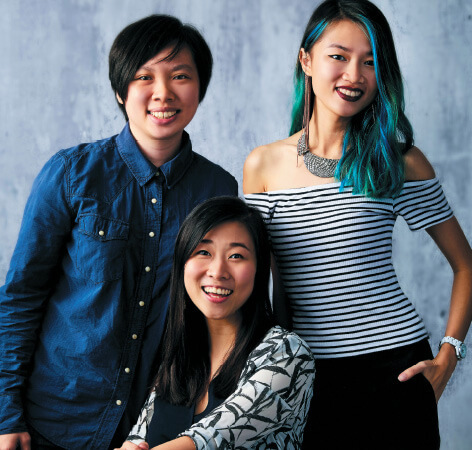 These three young women have been poster children for Malaysia’s growing social entrepreneurial circle. They admit that the attention has worked to their advantage but also point out that it has meant more hard work to achieve speedier results. “Besides being passionate about the cause, I think one of the factors that helped us get here is that we are a very good team with different strengths. We constantly push each other and take turns to encourage one another,” says Lee. Enjoying a rare evening off at The Edge Inspiring Young Leaders Awards 2017 event, Lee says the accolade — The Picha Project’s first — is a great honour and opportunity to share a stage with the people they look up to, including the founders of EPIC Homes and Teach For Malaysia, a big encouragement. The trio do not see themselves as role models, at least not yet, but are more than happy to share the experiences they have gained. “I think the most important thing is to know why you’re doing this, to keep reminding yourself. Recently, one of our Syrian partners, Zaza, passed away from cancer after a painful treatment process. All eight other families had been there to support them and the death impacted us a lot. But what was comforting was that when we asked the wife whether she was okay, she said, ‘Zaza won’t be worried, knowing you are all here’. To us, that was the ultimate affirmation of trust. It is not the kind of business from which we can just walk away. We don’t just buy their cooking, we are involved in their lives. They call us when they have medical issues, when their children have no school or when they have problems …” says Ling.